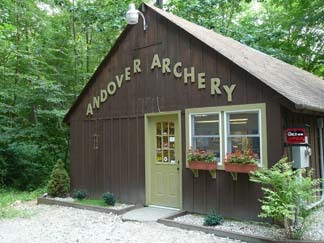 Although Andover Archery center is a relatively new business the owners have accumulated more then 60 years experience in the business and sports of archery. Andover Archery provides both shopping on line or you can come and visit us at out newly renovated archery shop. We are located in rural eastern central Connecticut. The shop is nestled in the mists of 24 acres of hardwood with a stream and pond. We offer a full retail pro shop, full bow and arrow repair capability with an indoor bow tuning and trial area as well as large outdoor shooting range including 36 target 3D range, tree stand and broad head shooting. Most manufactures set what is called a map (minimum advertised price). This means the seller cannot advertise these products lower than these set prices. Most shops sell higher than these minimums. Andover archery never sells higher than the map and still offers the most extensive customer service anywhere. Because you deal directly with the owners we guarantee your satisfaction. Compare our new bow trial policy. If you want or need instruction we will teach you. We will fit the bow to your required draw length and weight. We will install and tune you choice of arrow rest and peep sight. Mount your choice of sights. Help you sight in. You can then test shoot for feel and accuracy up to 70 yards on our outdoor range. No one else offers anything close to this. And you won't pay more and usually less than anywhere else. You would expect and be happy to pay more but our low overhead allows us this great advantage. Let us help you improve your accuracy and success. Crossbow hunting has come to Connecticut. We have the New 2019 Prime Logic 31", 33" & 35" compound bows available in the store today. We have a good supply of New 2018 Elite Archery compound bows to try and purchase including the popular Ritual. We are happy and proud to announce we are Obsession and Darton Compound bow dealers with new product to test shoot and sell. We are also Connecticuts primary supplier of the G5 Prime compounds. 2019 models have just started to arrive. You owe it to yourself to try an Elite and G5 Prime before you purchase any other brand. See & feel what all the buzz is about. Click the images above to bring you to the Elite or Prime websites. 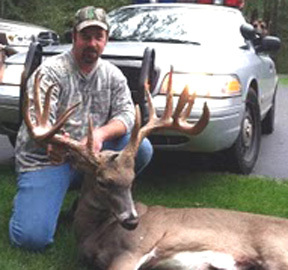 Congrats Dan O'Brien Life long Andover Archery Customer and now holder of the New England Non-typical archery whitetail record holder 226 7/8"